Enjoy pure nature and quietness . Medieval farmers settlement on the hillside of the Montefeltro area with mosaic--pool and a stunning view over the Appenin. Up to 15 persons find place in 3 lovingly restored units.Here you live in an original ancient surrounding. The stonewalls, cotto pavements and beam cielings mixed with mosaics provide a very particular feeling. Every unit has its own private and independent outdoor space, furnished with dining table and sun-beds and barbecue facility. It's all really spacious. The "PRINCIPAL HOUSE" is our biggest unit. With 8 sleeps in 3 bedrooms and 2 bathrooms it's perfect for two families. You enter the house with 5 stairs and you are in the kitchen, with eating table and fire-place. The sink is the same as it has been 100 years ago: in concrete with view out of the window over the hills. Other stairs bring you to the first floor and into the comfortable living-room with TV. Around the living are the 3 bedrooms. The blue room with 1 double-bed and 1 single-bed, the two bed room with one double-bed, which is also separable and the other 3 bed room with also a separable double-bed and single-bed. There is also the main bathroom with tub. The second bathroom is under the kitchen just some steps nearby the entrance. Directly at your house you have also access to the common dining-room and kitchen, which you are free to use. All around is your outdoor area with furniture and you have an extra terrace with the best view to the Appenin. The position of this house is south-west. Between and around the houses are gardens, and several common and private "piazzas". The mosaic-pool is the very heart of the property. It has about 50 sqm. At the access it is deep 1m and goes slowly down to 2m. Adjacent are a pool-house - with coffee maker, library, toys, games and information material, a shady balcony and three sun-terraces. There is also a fire-place for barbecue. You can pick your vegetables and fruits from my organic garden and orchard. I offer a mosaic-workshop and you can learn an easy way to make your own pasta. Sometimes we also make pizza in the old stone oven. I´m German from nearby Munich, With the purchase I fulfilled my dream. Since the very beginning I always lived here with my two boys, who are now 26 and 28. For 10 years I was working - together with a very talented mason and his friends - on the renovation of what was then only ruins and jungle. I loved this place at first sight, as it seemed to me outside of the world. Here I feel to be part of nature. I love this location in every part, but mostly for its view to the Sasso Simone. The kitchen of the Principal House has a small stove. There is the possiblity to use the big common kitchen, which is really big and well equipped. The property is hardly accessible for wheelchairs, as it is all hill up and down and stairs. Sorry about this! you can buy from me wine and grappa, marmelade, dry fruits and liquor. waren mit insgesamt 7 Personen (4 Ewachsene, 1 Teenager, 2 Kinder) in "Le Torricelli". Die Ausstattung war so wie beschrieben, das Platzangebot größer als erwartet. Herzlichen Dank für die 5 Sterne. Es war schön euch als Gäste zu haben. Almost every day there is a weekly market in one of the villages. 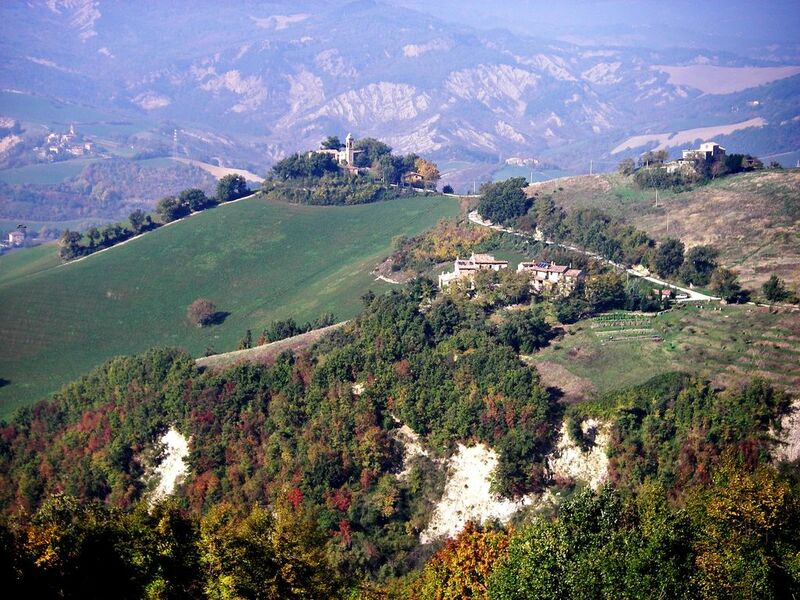 There are a lot of castles to visit, either nearby like Sassocorvaro or Piandimeleto, or a little bit farer away like San Leo, Gradara or Mondavio to name only a few. But the place of greatest interest is surely the UNESCO world heritage town Urbino.with its Palazzo Ducale. Every weekend durng summer and autumn takes place un other Festa or Sagra. Small or big, there is always fine food and wine and very often music for dancing. There are a lot of different restaurants easily to reach with the specialities of the region like tagliatelle, strozzapreti and passatelli, whch are all kinds of handmade pasta, piadina and crostini (antipasti) and bistecca chianina speaking of meat. Not to forget truffels and sweet chestnuts and local wine and liquor like San Giovese di Romagna, Bianchello del Metauro and Visner and Nocino..